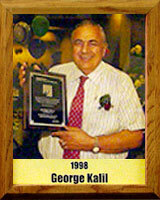 George Kalil, president of Kalil Bottling Co., has contributed to the Pima County sports scene for more than 25 years. Often called the University of Arizona basketball team’s “Number One Fan,” he has missed only two games during the past 25 years, once for a meeting of the Arizona Soft Drink Association and once for Fred Snowden’s funeral. In 1980, he accepted the invitation to serve on the newly formed University of Arizona Wildcat Club Advisory Board. Today he sits on the board of the University of Arizona Rebounders. He has been a member of both the Tucson Copper Bowl committee and the Tucson Fiesta Bowl committee since their inception. Now he serves on the board of directors for the State Fiesta Bowl Committee. He chaired the inaugural Tucson Fiesta Bowl Golf Tournament. He has served as Hotel Hospitality Chairman for the Tucson Fiesta Bowl Basketball Tournament every year it has been held.